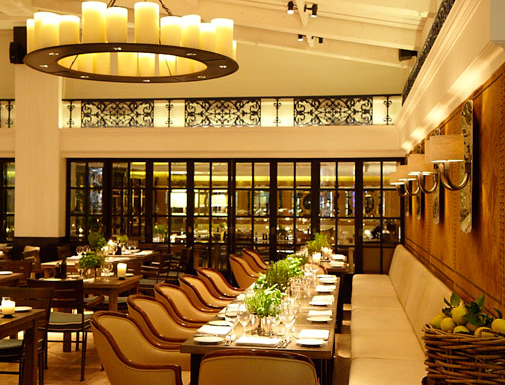 Epic is the only word to describe Novikov restaurant in Mayfair. The massive space is split into a slick Pan Asian restaurant, subterranean cocktail bar and a beautiful Italian restaurant, decked out for casual dining all under the most amazing fake ceiling. The restaurant serves regional Italian food starting with a selection of antipasti, which included the best buratta in the world, followed by homemade pastas (I knew we were in for a treat as Angela Hartnett was sat next to me tucking into a bowl!). They served a rich, wild rabbit ragu and taglierini with aged pecorino and black pepper, serving as a reminder of how Italians understand that using a few of the best ingredients is really all you need to create something sublimely delicious. Fish and meats followed, the highlight of the meal, well of my week actually, being the charcoal beef tagliata. The wonderful beef salad with peppery rocket and parmesan shavings was simply perfection. The beef was smokey, tender and seasoned beautifully. In fact, it was so good that I went back the following week for more. In keeping with the restaurant itself, the desserts were big – a silky smooth green tea crème brulee was really interesting – but all was dwarfed by the selection of daily baked cakes, most notably a molten chocolate entity that just simply could not have been man made. Surely they must have had a local divinity residing exclusively in their kitchen to create such a wonder!? Prices are equally sizeable, but you get ingredients to die for prepared as Italy intended. I have already been back in a very short space of time and can guarantee another visit soon. I suggest you do the same.